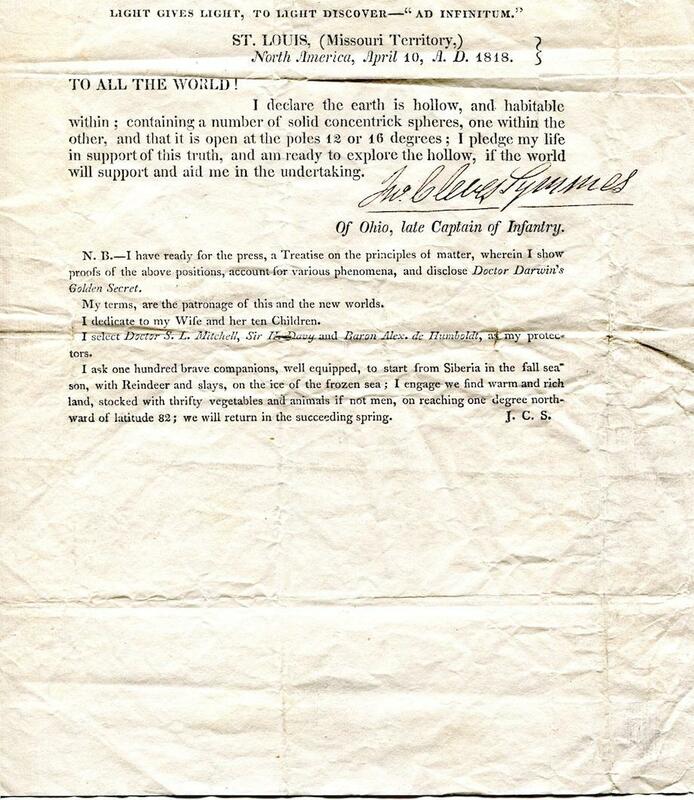 John Cleves Symmes: Believer in hollow Earth theory sent this open letter. As geographer Duane Griffin writes (PDF), Symmes sent 500 copies of the message to distinguished individuals and groups, including scientists, cities, learned societies, and universities. He attached a certificate of his own sanity to each copy. How did Symmes come to believe in this theory? Others had published versions of the same idea, including the astronomer Edmond Halley (better known for the comet whose orbit he computed), who hypothesized about a hollow Earth in 1691. But Symmes swore that his own belief came to him organically, from his extensive reading about natural history and geology in encyclopedias and explorers’ accounts. He pointed to magnetic variations around the poles, the migrations of arctic animals, and the existence of the aurora borealis, among other “proofs,” as evidence. In this circular, Symmes tries to associate himself with prominent and respected scientists. He calls upon Humphry Davy, the British chemist and inventor; Alexander von Humboldt, the Prussian explorer and geographer; and S.L. Mitchell, the founder of the Lyceum of Natural History in New York, to support him. All of these attempts to solicit intellectual patronage were in vain, and “Symmes’ Hole” (as it was called) became the laughingstock of the scientific community. Correction, July 25, 2013: This post originally misspelled Edgar Allan Poe’s middle name.